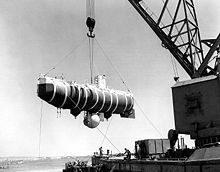 DSV-0 Trieste – the X-1 Trieste bathyscaphe has reached Challenger Deep, the world's deepest seabed. It was retired in 1966. DSV-1 X-2 Trieste II – an updated bathyscaphe design, participated in clandestine missions, it was retired in 1984. Alvin, owned by the Office of Naval Research (ONR) is operated under agreement by the National Deep Submergence Facility at the Woods Hole Oceanographic Institution (WHOI), where it conducts science oriented missions funded by the National Science Foundation (NSF), National Oceanic and Atmospheric Administration (NOAA) and ONR. Alvin has a maximum depth capability of 4,500 metres (2.8 mi) and operates from R/V Atlantis, an AGOR-23 class vessel owned by the ONR and operated by WHOI under a charter party agreement. The NSF has committed to the construction of a replacement sub with enhanced capabilities and 6,500-metre (4.0 mi) depth capability to replace Alvin, which will be retired upon its completion. DSV-2 Alvin – a deep diving sub, has a 4,500-metre (2.8 mi) depth capability, WHOI. DSV-3 Turtle – Alvin's identical sibling, retired 1998, USN. DSV-4 Sea Cliff – another Alvin class DSV sub, retired 1998, returned to active service on September 30, 2002, Sea Cliff has 6,000-metre (3.7 mi) depth capability, USN. DSV-5 Nemo – another Alvin class DSV sub, retired 1998, USN. NR-1 Nerwin – , a decommissioned US Navy nuclear powered research and clandestine DSV submarine, which could roll on the seabed using large balloon wheels. Aluminaut – a DSV made completely of aluminum by the Reynolds Metals Aluminum Company, for the US Navy, once held the submarine deep diving record. It is no longer operational. Deepsea Challenger – a DSV made by the Acheron Project Pty Ltd, has reached Challenger Deep, the world's deepest seabed. DSV Limiting Factor - a submersible commissioned to be built by Caladan Oceanic and designed and built by Triton Submarines of Sebastian, Florida. On December 19th, 2018 it was the first manned submersible to reach the bottom of the Atlantic Ocean, or 8,375 meters, thus making it the deepest diving, currently operational submersible. As of early 2019, the submersible was continuing its "Five Deeps Expedition" mission onboard its support ship, the DSSV Pressure Drop, to visit the bottom of all five of the world's oceans by the end of the year. Priz – a DSRV class of five ships built by the USSR and Russia. The titanium-hulled Priz class are capable of diving to 1,000 metres (0.62 mi). These mini-submarines can ferry up to 20 people for very brief periods of time (in case of a rescue mission) or operate submerged for two to three days with a regular crew of three to four specialists. In early 2005, the Russian AS-28 Priz vessel was trapped undersea and subsequently freed by a British ROV in a successful international rescue effort. Mir – a strictly civilian (research) class of two DSVs which were manufactured in Finland for the USSR. These bathyscaphe-derived vessels can carry three people down to depths of 6,000 metres (3.7 mi). After visiting and filming the RMS Titanic's wreck, two Mir submersibles and their support ship were loaned to a US Pacific trench surveying mission in the late 1990s and made important discoveries concerning sulphuric based life in "black smokers". AS-12 – a Russian counterpart to the American NR-1 clandestine nuclear DSV, is a relatively large, deep-diving nuclear submarine of 2,000 tons submerged displacement that is intended for oceanographic research and clandestine missions. It has a titanium pressure hull consisting of several conjoined spheres and able to withstand tremendous pressure — during the 2012 research mission it routinely dove to 2,500 to 3,000 metres (1.6 to 1.9 mi), with maximum depth being said to be approximately 6,000 metres (3.7 mi). Despite the three-month mission time allowed by its nuclear reactor and ample food stores it usually operates in conjunction with a specialized tender, a refurbished Delta III-class submarine BS-136 Orenburg, which has its missile shafts removed and fitted with a special docking cradle on its bottom. Konsul – a new class of Russian military DSVs, currently undergoing final acceptance trials before the official commissioning into the Navy. They are somewhat smaller than the Mirs, accommodating a crew of two instead of three, but are purely domestically produced vessels and have a higher maximum depth due to their titanium pressure hulls: during the tests the original Konsul dove to 6,270 metres (3.90 mi). Nautile – a DSV owned by Ifremer, the French Research Institute for Exploitation of the Sea. The titanium-hulled Nautile is capable of diving to 6,000 metres (3.7 mi). DSV Shinkai – JAMSTEC (Japan Agency for Marine-Earth Science and Technology) operates a DSV-series called Shinkai ("Deep Sea"). The latest DSV is Shinkai 6500 which can submerge to 6,500 metres (4.0 mi) with three crew members. JAMSTEC was operating a ROV called Kaikō, which was able to submerge to 11,000 metres (6.8 mi), but was lost at sea in May 2003. Pisces class DSVs are three person research submersibles built by International Hydrodynamics of Vancouver in British Columbia with a maximum operating depth of 2,000 metres (1.2 mi) capable of dive durations of 7 to 10 hours. A total of 10 were built and are representative of late 1960s deep-ocean submersible design. Two (Pisces IV and V) are currently operated by National Oceanic and Atmospheric Administration and the first production vehicle is on display in Vancouver. Pisces VI is undergoing retrofit. Jiaolong class bathyscaphe (Jiaolong): Developed from Sea Pole class, 1 built. Harmony class bathyscaphe: Developed from Jiaolong class, 1 built. Shenhai YongshiDSV built in China and can dive to 4500m. Ictineu 3 inside a warehouse in Sant Feliu de Llobregat, Catalonia. Ictineu 3 – a three-men manned DSV. The hull is made of inox steel and it has a large 1,200-millimetre-diameter (47 in) semi-spheric acrylic glass viewport. It is designed to reach depths of 1,200 metres (3,900 ft), thus being the ninth-deepest submersible, and it is capable of diving during 10 hours using li-ion batteries. Bathyscaphe Archimède – French-made bathyscaphe, operated around the time of the Trieste. ^ "Trieste". History.navy.mil. Archived from the original on 2010-03-17. Retrieved 2012-03-27. ^ "Trieste II". History.navy.mil. Archived from the original on 2004-03-08. Retrieved 2012-03-27. ^ "No Name (DSV 1)". Nvr.navy.mil. 2009-09-14. Retrieved 2012-03-27. ^ "No Name (DSV 2)". Nvr.navy.mil. 1990-10-25. Retrieved 2012-03-27. ^ "No Name (DSV 3)". Nvr.navy.mil. Retrieved 2012-03-27. ^ "No Name (DSV 4)". Nvr.navy.mil. Retrieved 2012-03-27. ^ "No Name (DSV 5)". Nvr.navy.mil. Retrieved 2012-03-27. ^ "NR 1 Deep Submergence Craft". Archived from the original on October 18, 2004. ^ "Reynolds Aluminaut". Archived from the original on October 12, 2004. ^ Dean 2018-12-21T17:15:00-05:00, Josh. "An inside look at the first solo trip to the deepest point of the Atlantic". Popular Science. Retrieved 2018-12-29. ^ "Ледовый поход Лошарика" [The Losharik Ice Tour] (in Russian). 29 October 2012. ^ Alexei Mikhailov; Vladimir Boloshin (29 October 2012). "Военный атомный батискаф «Лошарик» испытали в Арктике" [Military atomic bathyscaphe "Losharik" tested in the Arctic]. Izvestia (in Russian). ^ ""Консул" испытан – ВПК.name" ["Consul" is tested] (in Russian). Vpk.name. 22 June 2011. Retrieved 2012-03-27. ^ "Submersible Consul tested: Voice of Russia". :. 2011-07-07. Retrieved 2012-03-27. ^ "Robot sub reaches deepest ocean". BBC News, 3 June 2009. ^ Soro, Selena (11 May 2015). "LIctineu 3' lluita per sobreviure" [The Ictineu 3 fight to survive] (in Catalan). Ara. Retrieved 31 January 2016. Wikimedia Commons has media related to Deep diving submarines. "Deep Submergence Vehicle (S-P)". Naval Vessel Register. "Deep Submergence Rescue Vehicle (S-P)". Naval Vessel Register. "Research Vessels and Vehicles". Japan Agency for Marine-Earth Science and Technology. "Robot sub reaches deepest ocean". BBC News, 3 June 2009.